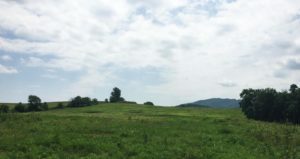 The New River Land Trust has joined forces with the Virginia Department of Conservation and Recreation (DCR) and The Conservation Fund to protect an important property in Floyd County, adjacent to the Camp Branch Wetlands Natural Area Preserve. NRLT has purchased the property and is now holding it for eventual transfer to DCR. In the short term, the Land Trust’s ownership will ensure the land will be protected from development until it can be transferred in the next several years to DCR and be incorporated into the Natural Area Preserve. We are grateful to The Conservation Fund for making the purchase of this property possible. The Conservation Fund’s financing, partnership and technical assistance make it possible for conservationists, community leaders, land trusts and government to swiftly and efficiently safeguard properties for wildlife, recreation, historic significance or to help balance our built environment. Conservation is very much a collaborative effort in Virginia, and this project is an example of how the Land Trust works with private owners and conservation partners to protect the New River region’s important natural resources. The post NRLT Acquires Property in Floyd County appeared first on New River Land Trust. This article has been featured on our site to highlight the news and updates from our members. The original source can be found on the New River Land Trust website. View the original article here NRLT Acquires Property in Floyd County.